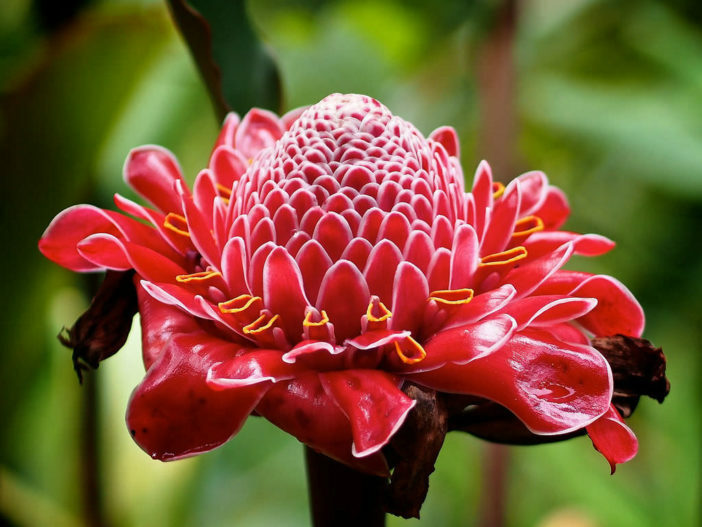 Etlingera elatior, aslo known as Torch Ginger, is a showy addition to the tropical landscape, as it is a large plant with a variety of unusual, colorful blooms. Torch Ginger plant information says the plant, an herbaceous perennial, grows in areas where temperatures fall no lower than 50°F (10°C) at night. This limits growth to USDA Hardiness Zone 10 and 11, and possibly zone 9. Torch Ginger may reach up to 20 feet (6 m) in height. Plant it where it is somewhat protected from the wind, which can snap the shoots of this tropical plant. Due to the large height, growing in containers may not be feasible. The unusual Torch Ginger flowers may be red, pink or orange — blooming from colorful bracts. White blooms have been reported in some plant information, but these are rare. Buds are edible, flavorful and used in Southeast Asian cooking. When growing these plants in established beds, fertilize with a food that is high in potassium. This is the third number on the fertilizer ratio displayed on the packaging. Once the potassium is right in the soil, watering, an important part of learning how to grow torch ginger successfully, will be more beneficial.